With its excellent screen, camera and battery life, the Moto X Play is a great value handset in its own right and punches well above its weight. The design, performance, and battery life of the Moto X Play definitely makes this phone from Motorola an affordable option that will meet the needs of most smartphone users and should last at least 2 years before requiring an upgrade. The Moto X Play isn't the Motorola flagship that we're excited to see, but it's a very good handset for the price and a solid rival to the OnePlus 2. The low-light camera performance disappointed and the screen isn't the best on the market, but Moto X Play offers a premium design, smooth performance, bloat-free Android and an excellent battery life. The Moto X Play is a really good smartphone. It is well built, offers a decent camera, very good battery life and good performance, but in a market where margins are thinner than a sheet of newsprint, Motorola may struggle to convince many to buy this over its budget Moto G smartphone. ...It has a top-notch camera in its price class, has phenomenal stamina and is built like a beautiful tank. It's got a great screen and it has an unadulterated version of Android with some of the most useful tweaks a phone can have. It's just priced a bit wrong and has some minor quibbles with performance. Motorola will certainly be up front in the mid-range with its Moto X Play. The superb screen, the durable battery, and the high-resolution camera will ensure that. This is a great phone at a great price. The camera is solid, the screen is crisp, and Motorola's added software features provide just the right amount of functionality without getting in the way. If you can get past the poor speaker quality and lack of included Turbo Charger, you might want to consider picking up a Moto X Play for yourself. With its bright, bold display, powerful processor, great camera and water-resistant design, the Motorola Moto X Play isn't just a great phone for the price, it's a great phone, full stop. It's got everything you should expect from a high-end device, and the ability to customize its look is just the icing on the cake. Almost half the price of some comparable devices, the Moto X Play sets new standards for the mid-market smartphone space. Yes, there are better looking handsets doing the rounds, but with a stunning screen, largely impressive camera and hugely positive battery life, there are few that can compete at this price. The Moto X Play does a lot right with an impressive camera, superb battery life and attractive price, but there's a frustrating number of missing features and options. There's a lot going for the Moto X Play, but not quite enough when you compare it to its more impressive stablemate. It's still a very good smartphone, and it's pretty good value given the spec list, but it feels a bit like a phone that doesn't know quite what it wants to be. With best-in-show battery life around and solid features, the X Play is the workhorse phone you'll want.... More than just a series of specs on paper, the Moto X Play delivers reliable execution. It's a workhorse for the user who simply wants a phone that works well. It won't amaze you but its long battery life makes this a step up from similar mid-range devices. 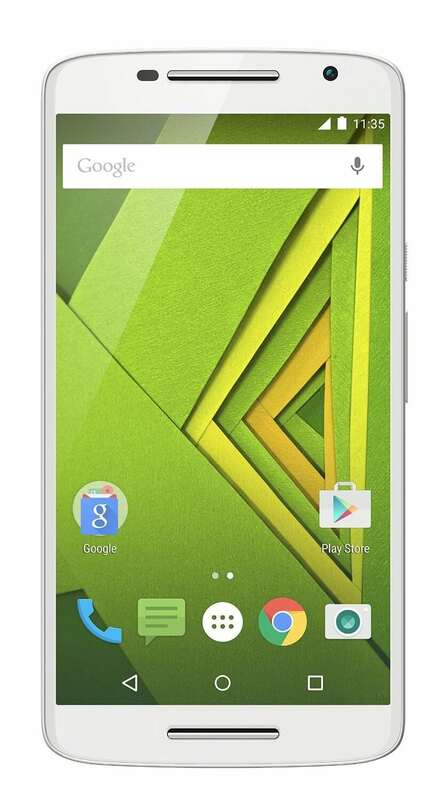 The Motorola Moto X Play is a big-screen Android smartphone with customisable backs and accent colours. It´s a very well-specified, balanced phone with a good processor, Full HD display, excellent camera, and very strong battery life, but is larger and heavier than most phones. The Moto X Play is a solid, affordable choice for anyone who wants ;above average battery life and camera performance for a mid-range price. The Moto X Play is a good phone, but the mono speaker is disappointing and despite increased resolution in the camera, it still doesn't produce the high-end results we expected. Sure, the low-light camera performance disappointed and the screen isn't the best on the market, but Moto X Play offers a premium design, smooth performance, bloat-free Android and an excellent battery life. Squeezed between the Moto G and the Moto X Style, the Moto X Play is a more-than-decent mid-range smartphone; if you can't get an invite for the OnePlus 2, it's an excellent alternative. The Moto X Play is a solid if unspectacular performer, with no real feature that stands out - as is evident from our ratings. The Moto X Play is all about no-frills functionality. It's a great value smartphone. The Moto X Play is the current leader of that small stack, eschewing the pure power and typical metal construction of its high-end counterparts. But it's also a phone full of compromise. Its battery is tremendous, and its camera a world away from its predecessor's. But its lower base price is felt in its plastic construction and vexing exclusions. With a fantastic display, detailed camera and a battery that can last all day, the Moto X Play continues Motorola's impressive run of smartphones. It's close to being fantastic, only let down by a collection of small niggles with the camera, buttons and speakers, but is still excellent value for a name-brand, easy-to-buy smartphone. The Moto X Play slots solidly in the middle between the Moto G and the upcoming Moto X Style, and if it's any indication of what to expect from the Style, we should be in for a treat with the top of the range model. That's not to say the Play is bad at all - anything but, and you get a decent phone that's as close to stock Android as you could wish for; battery life is astounding; and it sports Motorola's best camera to date. The Mototola Moto X Play is one of the best phones to consider if you want a quality phone without paying a high-end price. t maxes out the camera and battery while offering a nice big screen that isn't shown up too badly by any phone, anywhere. Overall, the Moto X Play is a decent mid-range phone... The camera is good, as is the screen, but performance could be better - as could battery life. The Motorola Moto X Play offers solid value for money. It ticks all the boxes for someone who would like a no-frills handset that will take them from work to play without the need to juice up. You get a nearly pure Android experience in a splash-resistant body with expandable memory. Moto X Play has some shortcomings, but is good value for money. The camera in particular is a stark improvement from previous Motorola handsets. While not a flagship -- by deliberate design -- some of Moto X Play's features put it among the most convincing mid-range devices we have seen so far. So who, if anyone, should buy the Moto X Play? Battery life enthusiasts, first and foremost. Motorola has focused on marketing its new camera and the fun of customizing your own X Play via Moto Maker, but the thing that really makes this handset stand out is its big battery. Two days of real-world use on a single charge are valuable to anyone and everyone. Plus that massively upgraded camera helps to distinguish the X Play from Motorola's own Moto G, which could otherwise tempt the more frugal buyer away. The Moto X Play seems built for one thing. It can't compete with other devices on specs, but it will last you two days on a single charge. If you prioritize battery life over everything, it's definitely worth considering. This is a good device for the price. It lacks some of the more flashy features of higher-end devices like a fingerprint reader and wireless charging, but it is a robust phone offering a pleasingly clean Android experience and exceptional battery life. Plus it offers the fun factor of being customisable. It does a good job in most areas, and while it perhaps isn't as exciting as its cheaper rivals, it certainly nails one thing above and beyond its competition: battery life. If the things it does well are the ones which matter to you then it should definitely be on your shopping list. The Moto X Play is a curiosity in more than a few ways. It's surprised us with what it's good at - the generally decent camera experience, long battery life and impressive display. What's arguably more surprising, though, is what it's bad at - mainly the intermittent performance lag that's so unlike our experiences of previous Moto phones. Every day, we search through thousands of tariffs and offers from UK online retailers to find the best Motorola Moto X Play deals and contracts across a selection of price points and needs. Select 'Pay Monthly' if you're looking to get the Motorola Moto X Play as part of a monthly contract with minutes, data and texts. Alternatively, choose 'No Contract' if you prefer to buy the Motorola Moto X Play SIM Free or on Pay as You Go. Finding the perfect deal is easy. Just use the sliders to filter tariffs for minutes, data, monthly cost and upfront cost. You can also filter by network and retailer to find the best Motorola Moto X Play deal for you! The cheapest contract price in this category is cheaper than buying the Motorola Moto X Play SIM Free and a comparable SIM Only tariff by . You could save on the cheapest contract price in this category by buying the Motorola Moto X Play SIM Free and a comparable SIM Only tariff separately.